From October 17, 2003 to March 31, 2004, MURAO Rumiko (enrolled in FY2000) conducted an ecological survey and research on the farming system in villages on the east bank of the Zambezi River in Western Zambia. The research revealed that the relationship between the Lozi and the Bunda (a group of Angolan migrants) differs depending on the ecological environment and the history of the village, and that the two groups maintain a relationship of mutual dependency in land use as well. The form of livelihood strategy that these ethnic groups, with different backgrounds, will adopt to respond to the spreading cash economy will be clarified in view of the relationship with the ecological environment. From October 25, 2003 to March 10, 2004, MARUYAMA Junko (enrolled in FY1999) conducted a field survey in Kx'oensakene Village and in the neighborhood settlements in the Ghanzi District of the Republic of Botswana, concerning social changes brought about by the resettlement of San hunter-gatherers, and she elucidated the food exchange network among residents and the structure of dwelling forms in the settlement. She also undertook researches in other settlements, collecting materials about the migration history of the San in Central Kalahari since the 1930s. Compiling these findings, she will examine the response of the San people to the rapid ecological and socio-environmental changes resulting from their relocation and the characteristics of the San community as well as changes observed within it. From January 30 to March 31, 2004, NAKAYAMA Setsuko (ASAFAS research fellow), conducted an interview survey on the history of fishing gear in five villages on the shores of Lake Malawi, Republic of Malawi. She found that fishing activities in these survey areas, which so far were considered to be "traditional fishing," have in reality undergone great changes both technically and socially in the process of the area being integrated into Southern African economic sphere in the wake of modernization. The process of renovation of fishing gear and techniques and changes in the social relationships surrounding the division and distribution of the fish catch, triggered by the experience of working away from home in Southern African cities, will be reconstructed through interviews and the examination of historical documents. From October 18 - November 16, 2004, ARAKI Shigeru (ASAFAS faculty member) carried out an investigation into recent changes in farming villages in Kariza Village, Chadiza District in the Eastern Province of Zambia and in four villages in Omusati and Oshana, Northern Namibia. In Kariza Village, with the abrogation of the corn price maintenance policy following the introduction of structural adjustment policies, there has been a notable development of fields on the premises using cattle manure and a shifting to commercial crops such as cotton and tobacco. In Namibia, ARAKI investigated field areas, family composition and the population of villages with different ecological environments, and based on this, calculated the land's carrying capacity. A staff member of the Institute of Social and Economic Studies, University of Zambia, and Prof. SHIMADA with the library in the background. The highway in Oshakati, equipped with street lights (Namibia). In Oshakati, a city in Northern Namibia, which has received heavy capital investment in recent years, there are many banks, superstores, boutiques and other shops have emerged run by "colored" people. A traditional house made of mopane timber in Ovamboland (Namibia). A network of water services and electricity has developed mainly in Oshakati and in its vicinity. The city of Windhoek (Namibia) is located in acacia bush in between the hills. The high-rise buildings in the center are offices along the main street, crowded with white, colored and black white-collar workers. 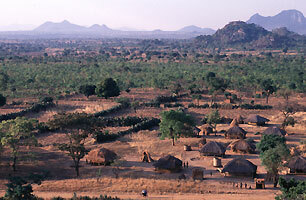 A typical farming village landscape in Eastern Zambia. Villages stretch out on the plain, surrounding the granite monadnocks. Prior to the introduction of the structural adjustment policies, this was a major corn-growing district, but now the products have been diversified to cotton, tobacco, etc. A room was rented at the residence of a Japanese working at the Japanese Embassy in Zambia, and its computer and electronic environment was developed and improved to help the gathering and cooperative researches of the students involved in the Zambia FS. A participatory database is currently under construction using GIS, and the work of data gathering is continuing. In the next fiscal year or thereafter, when the station's functions are improved, a stand-alone office will be established. A network of Japanese and African researchers involved in Southern African studies is currently being developed, centering around the Institute for Economic and Social Research, University of Zambia. Dr. E. Mulenga, Director of the Institute and Prof. Chidumayo of the Faculty of Science, who act as the FS counterparts, will promote cooperation among counterparts in the Southern African countries. In FY2005, a workshop "Socio-Economic Changes and Community Changes in Southern Africa" is planned. Dr. E. Mulenga, Director of the Institute for Economic and Social Research, University of Zambia, is scheduled to visit Japan from November 2004 to March 2005 as an ASAFAS visiting associate professor. During his stay, intensive workshops will be organized to clarify the structural outline of area studies in Southern Africa.